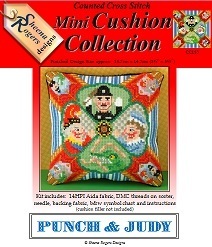 A Punch and Judy show is a real treat on a day out to the seaside and this mini cushion design features Mr Punch and his wife Judy, with a Policeman chasing the Crocodile who has stolen all the sausages! Each corner of the design contains a mini scene from the puppet theatre too, with two characters in each one, surrounded by rich red curtains and gold braids. Seaside stripes of blue and white also feature. Only whole cross stitch and some backstitch detail is required to stitch this design. That's the way to do it! This Punch & Judy themed mini cushion cross stitch kit includes: 14HPI white aida, ready-sorted DMC stranded cotton threads on sorter, needle, backing fabric, b&w symbol chart and instructions (cushion fiiller not included).